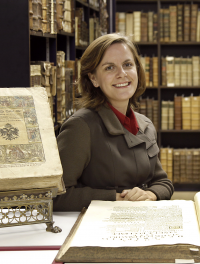 Violet Soen KU Leuven PI Transregional History Series editor Habsburg Worlds (Brepols) Welcome! Violet Soen is an Associate Professor in Early Modern History at the University of Leuven, Belgium and Editor-in-chief of the series Habsburg Worlds at Brepols Publishers. In 2018, she was visiting P.P. Rubens-Professor at UC Berkeley, after earlier fellowships at Columbia University (New York), EUI (Florence), EHESS (Paris) and UPFH (Valenciennes). She takes a special interest in the religious and political history of the Spanish Monarchy, the Low Countries and France, and especially their borderlands. Her fields of expertise include questions of religious war and peace, inquisition and reconciliation, church-state relationships and the history of the Catholic and Protestant Reformations between 1500 and 1800. Her wide-ranging research interests also embrace book history, history of the universities and elite studies. Her current research centers around two main themes: the search for religious peace and co-existence and its impact on ritual life, and the impact of crossing borders in early modern times. In this context she explores the methodological advantages of transregional history and the crossovers between history and civil society. Violet Soen has coedited seven volumes in the field of Habsburg studies and Reformation studies. She is the author of two award-winning monographs, Vredehandel on Habsburg attempts at peace and reconciliation during the Dutch Revolt (Amsterdam University Press in 2012) and Geen pardon zodner paus! on the sixteenth-century inquisition in the Low Countries (Royal Flemish Academy of Belgium in 2004). Her latest book Geschiedenis is een werkwoord (University Press Leuven 2016) is a manual to introduce first-year students to the historian's craft. She published more than sixty articles and book chapters in English, French, Spanish and Dutch. She sits on the editorial board of the Revue d'Histoire ecclésiastique-The Louvain Journal for Church History, The Early Modern Low Countries, Refo500 Academic Studies, and Nieuwe Tijdingen. She is board member of the Reformation Research Consortium, the Flemish-Dutch Association for Early Modern History, and the Fondazione per le scienze religiose in Bologna. She obtained research funding from the H2020-scheme, FWO and KULeuven. Violet Soen is an active science communicator and campaigner for citizen science. She is involved in communicating the understanding of early modern religious history in writing and through appearances in various media outlets.